Apple is introducing its new Watch across a limited number countries today, but only a few stores will have the device available for sale. Among that short list is Colette, a fashion boutique just a few blocks from Apple's own retail store at Carrousel, beneath the Louvre. 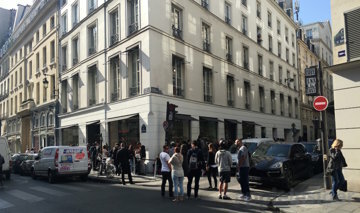 By 10 a.m., more than 150 people were lined up at Colette, forming a queue around the corner and nearly all the way down to the Tuileries gardens. The line didn't start moving until 11 a.m. It did however attract lots of attention, and at times snarl traffic along Rue Saint-Honoré as curious onlookers and media blocked sidewalks and walked out into the narrow streets. Paris police were also on the scene, armed with automatic weapons. 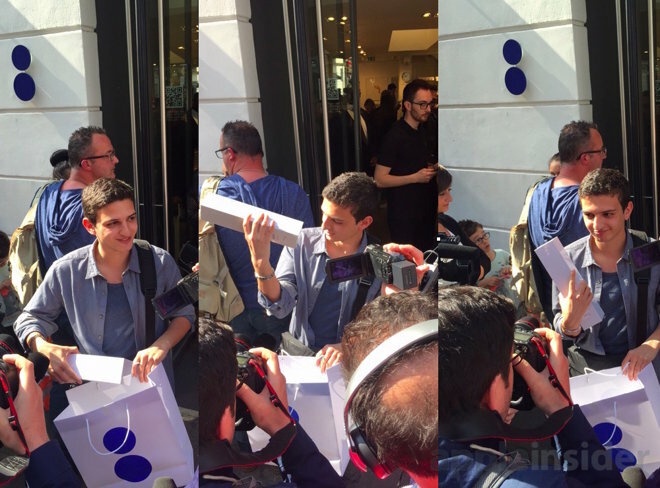 Shortly after the first customers entered the store, the first buyer —a young man named Teddy, living in Paris —emerged with a Colette bag and was immediately accosted by media cameras and boom mics. He told me he'd chosen the 42mm Apple Watch Sport with a black band. It's not yet clear how many more customers will leave this store with the Watch model they wanted. As the line grew, a young English man pulled open the door of his car, then signaled his driver to proceed to another location because "this line is too long." 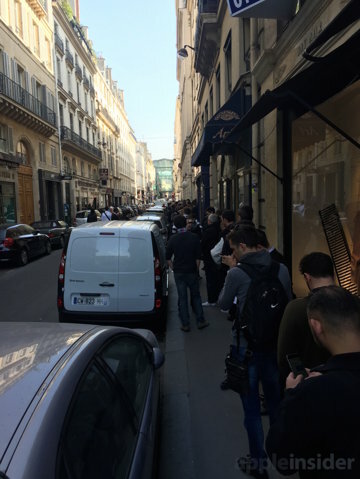 Waiting in line for an Apple Watch in Paris today is a major sacrifice, given that today is probably the last sunny day in a long stretch of beautiful weather. The forecast through the weekend and much of next week is rainy. Unseasonably warm weather has turned the city into a spring time paradise of flowers and leafed out trees, and turned lawns into sunbathing meccas stretching from Place Des Vosges to Parc Du Champ De Mars at the Eiffel Tower. 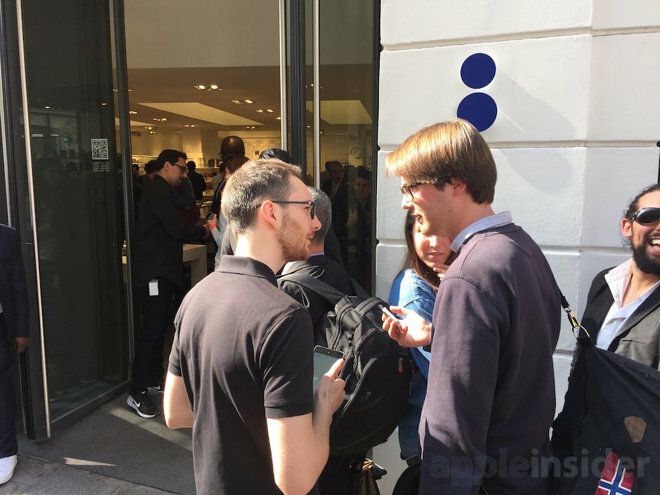 That hasn't dampened interest for waiting in line to be among the first to wear Apple Watch in a city known for its appreciation for fashion and design. In addition to Colette, Apple is also taking orders for Apple Watch at its own iconic stores in Paris, including Carrousel du Louvre, just a short walk through the Tuileries and under the Arc de Triomphe du Carrousel, which faced the glass pyramid in front of the Louvre that inverts into the Carrousel to illuminate the Apple Store itself, and throw bands of rainbows around the store. Apple also has a second Parisian retail store in a dramatic setting within a renovated former bank at Opéra. Apple Watch is also being shown at a dedicated boutique within the Galeries Lafayette rotunda just one block from its Opéra store. However, it appears that none of these stores have any inventory for buyers to immediately take home. 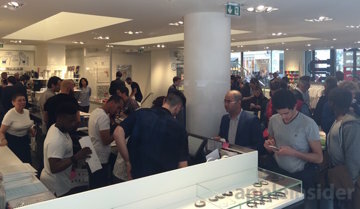 Apple retail stores and a few select high end retailers have been hosting Apple Watch fittings for customers for a week now, allowing them to try on light-weight aluminum Sport models or the standard stainless steel, test driving the variety of bands and two watch face sizes that all go on sale today. The complexity of selling a brand new product with so many personalized options has forced Apple to push the vast majority of orders online, rather than attempting to stock in-store inventories. The company hopes to take what it learns from this complex launch to further refine its sophisticated inventory management operations.